This style of whole dried chiles is one of the most important ingredients when it comes to adding a powerful chile heat to Thai recipes. These really pack a punch, and we love them. Very high quality, made from prik ki nu variety. Stems have been removed. Add heat to Thai stir fry, fried rice, as well as Thai soups. For an interesting view of the Thai street vendor using these chiles, see our video of Tom Yum and note the way she adds crushed dried chiles to boost the heat of the soup. In modern "fusion" cuisine that blends western flavors with Thai food, many chefs are using "chilli jam" made from whole dried chile. See video feature: Thai Prik Pao. 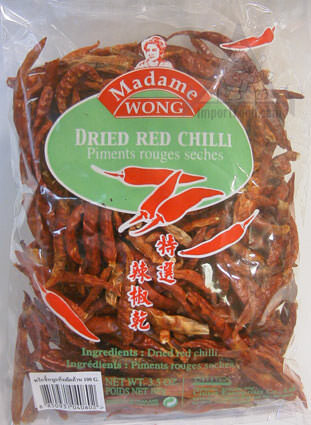 Important use: make your own ground Thai chile pepper (see below). Get the freshest bold flavor by making a small batch of ground Thai chile pepper at home, using whole dried chiles and a skillet or oven. Many Thai chefs swear by this method (preparing their own, rather than buying ready-made crushed chile powder). These are the best quality we've ever seen available, and 3.5 oz pack is a nice large size that will last, a great deal at the low price of $3.39. Product of Thailand. Crushing the chiles takes just a few whacks with the mortar and pestle, almost instantly you get beautiful, rustic ground Thai chiles. If you have a spice grinder or food processor, that works too. Enjoy! Southern-Thai Yellow Curry Soup, "Gaeng Lueng"
Fried Thai pastry balls with tamarind-garlic sauce, "Bayia"
Steamed Chicken Chiang Mai, "Gai Muang Nung Kreung Gaeng Nua"
Spicy pork and tomato dip with veggies, "Nam Prik Ong"